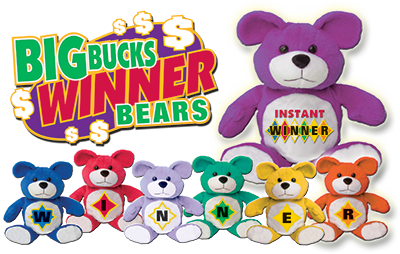 Here’s how “BIG BUCKS WINNER BEARS” works: Bears are sealed in an opaque bag hiding the letter on their belly. The player gets to draw a bear for each time they earn a set number of points on their players club card. The player is given a punch card and a punch is awarded to the corresponding letter on the card. Spelling WINNER wins $500.00. There are also INSTANT WINNERS mixed throughout the bears to build player excitement. Each foot of the bears are embroidered with your logo and any other information like phone numbers or city. For complete details and to learn how this promotion can be used at your property, contact us today.